Christmas is one of the most expensive time of the year to travel. How can you beat the price hikes? 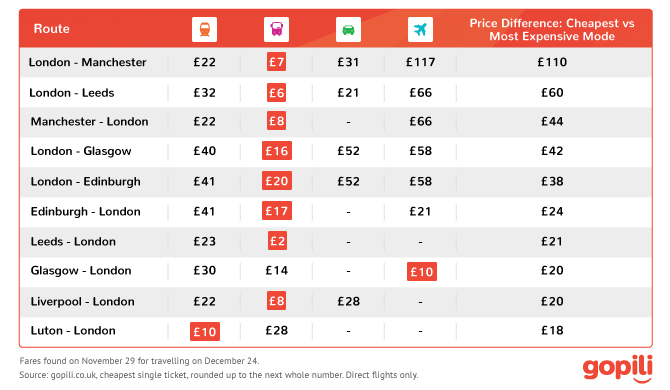 By analysing the fares on the 20 busiest routes in UK during the Christmas period, we found out how you can save up to £110 on your journey by travelling smarter. Travel fares vary significantly depending on the time of the day and most travel websites will display the cheapest departure time. But travelling on the right day can also reduce the cost of the journey back home for Christmas. By comparing the train fares for the 23rd and 24th of December, it turns out that you can easily reduce the price of their journey by half. Being flexible can help saving £22 for the London to Glasgow journey while the cheapest Norwich to London train costs £19 on the 24th and £9 on the 23rd which is twice cheaper. The same trick applies to other modes of transport. If you already know when you need to take your return journey, opting for 2 singles instead of a return ticket could save on average £37. Return train tickets give passengers some flexibility which could cost more, especially for longer journeys. When travelling from London to Glasgow for Christmas on December 24 & back to London on December 27, buying 2 singles instead of 1 return could enable to save £66. Comparing the price of 2 singles rather than a return ticket can also enable to find a better transportation mode for the return journey. The train might be the cheapest option for the outward journey but it might be cheaper to fly back. Train. Coach. Ride share. Flights. Choosing the right transportation mode is an easy way to get cheaper festive fares this Christmas. When comparing the cheapest price per mode of transport across the 20 busiest routes in UK, there is an average difference of £23 between the most and least expensive travel option. The coach is often the cheapest option and is on average £8 cheaper than the train. Looking at the routes where passengers can make the biggest savings, travelling by coach rather than plane from London to Manchester could save £110 at the time of the research. Flying from Glasgow to London on the 24th costs £10 and is cheaper than taking the train or the coach. As well as being a quicker way to go back home, it will save passengers £20. Our Travel search engine enables you to compare all transportation modes in one search for your journey back home for Christmas and find the best option. While the prices found for this study will change, these 3 tips will always help you find the cheapest tickets for your journey. Source: The analysis is based on the top 20 most-searched domestic journeys in UK according to Google Search data. The searches were made on the 29th of November 2016.